The Bradford family is pictured above. Farms that have been in Missouri families for over a century are becoming fewer every year. Agriculture is a $34.5 million business in Stone County, supported by both large and small farm enterprises and specialized niche agribusinesses. In an effort to recognize the heritage of farms in the state, the University of Missouri and Missouri Farm Bureau recognizes century farms each year. Recently the Stone County Extension Council honored a family who owns a century farm at an evening dinner in the Stone County courthouse. The event was underwritten by Table Rock Community Bank. 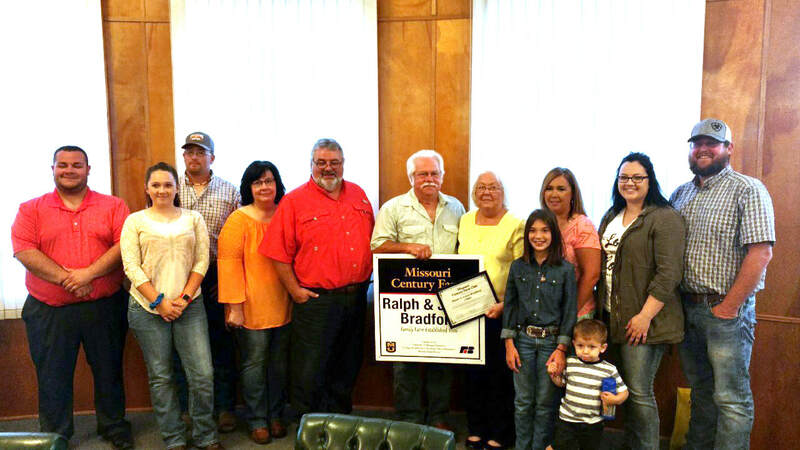 The family honored were Ralph and Joyce Bradford and their families. The farm is located near the Ponce De Leon community and was purchased in 1906 by William A. Bradford. The farm is composed of 60 acres. A certificate and Century Farm sign were presented at the dinner for the family to proudly display on the farm. The Bradford family is congratulated for their agricultural heritage in Stone County and the extension council wishes them success in their future endeavors. To qualify as a century farm, it must meet the following guidelines. The same family must have owned the farm for 100 consecutive years. The line of ownership from the original settler or buyer may be through children, grandchildren, siblings, and nephews or nieces, including through marriage or adoption. The farm must be at least 40 acres of the original land acquisition and make a financial contribution to the overall farm income. Since Missouri began the program in 1976, more than 8,000 century farms have been recognized. Applications for 2019 should be received by May 1 along with a $55 fee to cover the cost of a certificate, farm sign and booklet for approved applicants. For application forms and information, call Extension Publications toll-free at 1-800-292-0969, contact your local MU Extension office, or visit the program website at http://extension.missouri.edu/centuryfarm.